A leading expert in child psychology says that Indian Prime Minister Narendra Modi must apologise after he appeared to poke fun at dyslexia at a public event, triggering outrage. Mr Modi questioned if a programme for dyslexic children could also help a "40 to 50-year-old child" - in remarks that appeared to be an attempt to ridicule his political rival Rahul Gandhi. "When the head of a country talks like this, it is very, very insensitive. He must apologise," Dr Roma Kumar said. Her voice adds weight to the wave of condemnation of Mr Modi's comments. Dr Kumar is a clinical psychologist who specialises in learning disabilities and has worked at Delhi's Sir Ganga Ram Hospital for the past three decades. 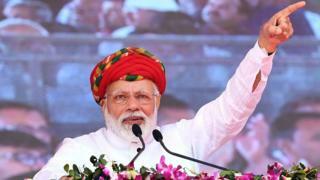 Is hardline Hindu politics failing India's PM? Dyslexia is a common learning difficulty that can affect reading, writing and spelling. Some well-known people with dyslexia include director Steven Spielberg and actors Tom Cruise and Abhishek Bachchan. According to a 2015 government estimate, at least 10% - or nearly 35 million - Indian children are dyslexic, although Dr Kumar says she believes the numbers to be much higher because there's "very little awareness" about the condition. "In the metro cities, teachers and parents are a little sensitised, but in smaller towns and rural areas, there is very little awareness. We don't have the tools to identify the children with learning difficulties in government schools, smaller towns and villages," she says. Mr Modi's comments were made on Saturday night when he was addressing engineering students who were participating in the Smart India Hackathon - an event meant to encourage students to come up with technology-driven solutions to issues related to women and child safety. The controversial comments came as an engineering student began telling Mr Modi - who was speaking via video link - about her programme. "We have an idea to help dyslexic children," she said, "whose pace of learning and writing is very slow. But they have a high intelligence and creativity level." She then referred to Taare Zameen Par, the 2007 Bollywood hit film which centred around a dyslexic child. At this point, the prime minister interrupted her and asked, "Will this programme work for a 40 to 50-year-old child too?" As the room dissolved into laughter and students began clapping, she answered: "Yes sir, it will." But before she could move on, the prime minister again interjected, saying: "Then that will make the mothers of such children very happy." Though Mr Modi did not name any names, it was immediately obvious that he was attempting to ridicule Rahul Gandhi, the opposition Congress party president, and his mother, Sonia Gandhi, also a politician. India faces a looming election before the end of May. Considering there's never been any talk of Mr Gandhi being dyslexic, the prime minister's latest comments are being seen as a distasteful attempt to denigrate his political rival. Mr Modi has often described Mr Gandhi as "Pappu" - a generic name to signify a bumbling man of low intelligence. Neither Mr Gandhi nor his Congress party have so far commented. Mr Modi and his BJP party have not responded to the criticism. His supporters on Twitter - normally highly vocal - have not addressed the issue directly, though a few suggested that Mr Modi was mocking Rahul Gandhi and not dyslexics. But on social media and in press commentary, condemnation has been the overwhelming sentiment. Mr Modi, says Dr Kumar, "should apologise to the country, especially to those children and young adults who are dyslexic".